Click to download the Getting Started Guide. typically diminishes within the first 30 minutes of treatment. I understand there are special hair care recommendations. I understand that treatment scheduling will depend on machine availability. I will need to have a cap fitting done prior to the first treatment. I understand that if I use this service it will require additional time after the infusion (90-180 minutes). I understand that the goal of treatment with DigniCap is less than 50% hair loss. I am aware that shedding will occur and that DigniCap will not completely prevent hair loss. I understand that the amount of hair loss is dependent on several factors including the chemotherapy regimen, dosage, duration of drug infusion, chemotherapy drug, metabolism, and other medical conditions. 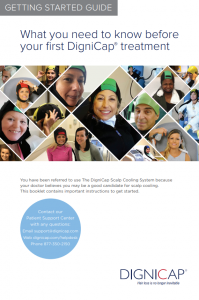 I understand that insurance may not cover the cost of scalp cooling treatments. I have discussed the DigniCap contraindications and warnings with my provider and understand these risks. I understand that scalp cooling results are variable and that there is no guarantee of success.